Phar Lap brought hope in the midst of a world depression. Big Red is a familiar name to horseracing fans. Man o’ War and Secretariat were both given this moniker thanks to their performance, power and presence. What few people realize is that a third racehorse, New Zealand born Phar Lap was also given this name, thanks to his racing prowess in both Australia and in Mexico. And while Man o’ War, Secretariat and Phar Lap were all mourned in their passing, Phar Lap’s demise was more tragic and tinged with mystery that remains to this day. Trust a racehorse to raise the spirits of a nation during the worldwide great depression almost 90 years ago. Phar Lap was born on October 4th in Seadown, near Timaru in the South Island of New Zealand. His name comes from the common Zhuang word and the Thai word for lightning. According to history, it was Aubrey Ping, a medical student from the University of Sydney who suggested the name ‘farlap’ knowing the word from his father a Zhuang speaking Chinese immigrant. Telford the owner liked the name, but split it in two and spelt it Phar Lap to create a seven letter word in keeping with the dominant naming pattern of other Melbourne Cup winners. Sydney trainer Harry Telford was interested in the horse thanks to his pedigree that included the same sire as the Melbourne Cup winner Nightmarch. Telford convinced American David J. Davis to buy the horse and his brother Hugh who lived in New Zealand got him for 160 guineas, 30 less than the amount Davis authorized him to spend at the Trentham yearling Sales in 1928. When Telford and Davis saw the gangly colt with warts on his face and an awkward gait they were not happy. However, like many racehorses the packaging belied the promise and Telford agreed to train the horse for nothing in exchange for two-thirds share of any winnings. He leased the horse for three years and was eventually sold joint ownership by Davis. Telford then had Phar Lap gelded and hoped he would concentrate on winning races and forget about the mares. Nobody took much interest in the horse and he finished last in his first race and didn’t place in the next three. But, like many horses who take time to come into their own, Phar Lap was a rose waiting to bloom…he just needed time, patience and a believer. He took a break for a few months and then started to race again; finally the racing public looked, and liked what they saw. He began to move up in class and he took second place in the Chelmsfod Stakes on September 14th in 1929. Sadly with fame comes unwanted attention and the criminal elements went so far as to try and kill him with a gun after a workout the day he won the Melbourne Stakes and three days before he won the Melbourne Cup as odds on favourite at 8-11. Over the next four years Phar Lap proved that he was a winner and he stole the hearts and minds of the race going public. He won 37 out of 51 races including the Melbourne Cup in 1930 and in that year and in 1931, he won 14 races in a row. As a three year old, when he won the VRC St. Leger Stakes and until his final race in Mexico he crossed the finished line first in all but three races out of 35. 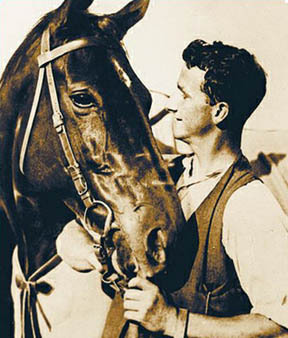 Tommy Woodock was Phar Lap’s devoted groom and was devastated by his death. Telford now had enough money to become joint owner of the horse and Davis decided that Phar Lap should go to America to show the other side of the world what he was made of. Telford was not happy with this decision and sent Tommy Woodcock as his strapper (groom). They took the long boat trip together to Aqua Caliente Racetrack near Tijuana, Mexico to compete in the Aqua Caliente Handicap which offered the largest purse for racing in North America. Once again Phar Lap showed exactly what he was made of and won the race in record time while carrying 129 pounds with Billy Elliot in the stirrups, his seventh win in seven rides. 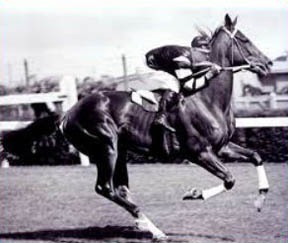 Phar Lap was then shipped to California while negotiations were held to allow him special race appearance. Woodcock found him on April 5th 1932 in his stall in great pain with a high temperature. Within hours the horse died from haemorrhaging. The rumours and speculation ran wild. A necropsy revealed that the stomach and intestines were inflamed and poisoning was suspected. Others said that lead insecticide and a stomach condition were to blame. In my next blog, we will find out what caused Phar Lap’s death but will we ever know who was to blame?